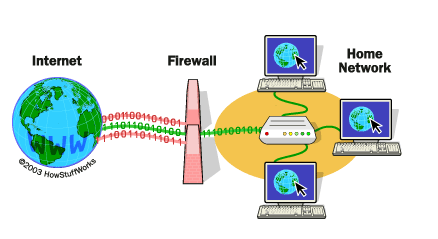 Firewall – It is software which provides security to documents on the Internet. It controls the incoming and outgoing network traffic between the ‘network of a firm’ and the Internet. It has a set of rules for every packet. The set of rules make a decision that if a packet passes or not. Generally a firewall is located between trusted network and non-trusted network. Packet-filtering firewall – In this type of firewall, a router serves as firewall. The router is equipped with data tables and allows the flow of only certain types of messages from a location. It provides a single point of security while directing the flow of data traffic. Circuit-level firewall – In this type of firewall, a computer is used as firewall instead of a router. The network programmer creates the necessary code for this computer for execution of transactions. Although the circuit-level firewall is better than packet-filtering firewall, yet it provides single point of security only. Application-level firewall – It is the most efficient amongst all types since it provides complete security to the network of company. In this type of firewall, a security zone is created between the network of company and the Internet. This zone consists of an isolation mechanism that contains several devices for security screening. To provide security, specific codes are used for each application and they are modified in accordance with modifications in the applications. Next Post What is the reason behind the different skin-colors of people?